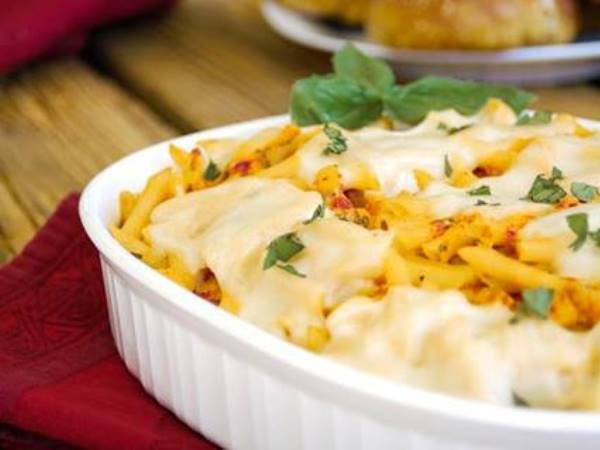 Three cheeses are better than one in this wonderfully gooey, cheesy and oh so easy pasta dish. Dress it up with bacon or mushrooms or leave it plain and simply delicious. Boil a pot of water and add the pasta to it, along with a tsp. of olive oil to ensure it doesn't stick together. Drain the pasta once it is cooked. Add to an oven dish, and mix all the ingredients in with it (along with pan-fried bacon and mushrooms if using). Slice the tomato and place on top of the pasta mixture, along with grated cheese of your choice. Bake in the oven at 200 °C for 30 min., or until the cheese has melted. Serve with an Italian side salad for extra crunch.